Email a link to this page to someone who might be interested. Info on The Town Abraham Lincoln Warned. You can go home again. Email D. Leigh Henson at DLHenson@missouristate.edu. Lincoln, Lincoln, we are proud of you. Lincoln, Lincoln, we will e'er be true. We get things done without much ado. We're happy, snappy, when we send our call. Lend your shoulders one and all. . . .
Springfield, MO–January 7, 2013 (and subsequently updated and expanded): An open letter to current and former residents of Lincoln, Illinois (2010 pop. 14,504). Public statues combined with historical markers invite and challenge citizens to discover the stories of local, state, and national history. These stories include accounts of how sculptors interpret and render their subjects. The sum of these stories, encompassing social, political, and cultural history, creates a living heritage that communicates core values and beliefs, helping to bond diverse social groups and succeeding generations. For the good of the nation, the American heritage must thrive locally, where it can enhance a community's civic pride and function as a marketing brand to strengthen the local economy through tourist appeal. New public statues of exemplary Americans add to our heritage, and for communities whose history has been blessed with the fabled touch of Abraham Lincoln, the answer to the question of what subject would be appropriate for new statues is a no-brainer. According to the Web site of the Abraham Lincoln Heritage Coalition, "Abraham Lincoln couldn’t be any more connected to a city than Lincoln, Illinois." This community has the distinction of having been named for and christened by Abraham Lincoln with watermelon juice in 1853, five years before the Lincoln-Douglas debates made him famous. Mr. Lincoln was the lawyer for both the town's founders and the company owning the railroad that led to the town's establishment. In addition, Mr. Lincoln had various other legal, political, business, and social experiences in this community, including Postville, which became part of Lincoln. The late, lamented historian Carl Volkmann reported that the United States has about two hundred original, bronze-coated Lincoln statues (in thirty-four states); and Illinois has fifty-six of them. Springfield, Illinois, with nine has the most original, bronze Lincolns, plus various replicas. Chicago has five original, bronze Lincolns, as does New Salem; Decatur, four; Bloomington, three. 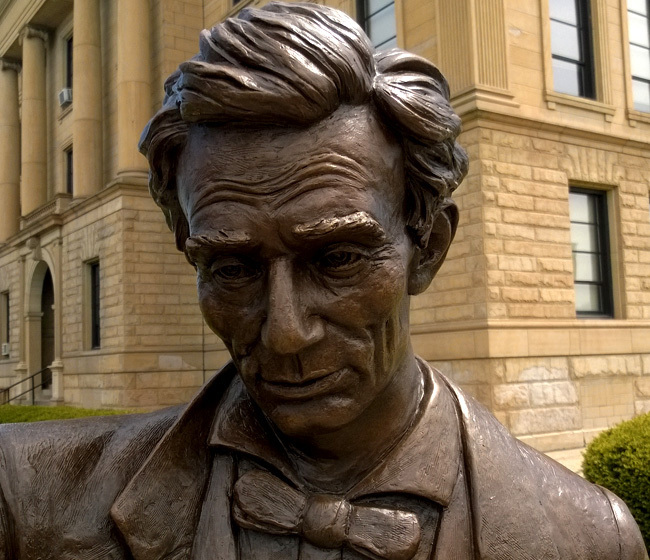 Lincoln, Illinois, as of 2015 has three original, outdoor bronze Lincolns. Additional Lincoln statues in Lincoln are fabricated with such other materials as plaster and fiberglass, and the city presently has a total of seven Lincoln statues. The following plan--obviously an ambitious, long-range plan--describes four more original, bronze statues of Abraham Lincoln for future development in his first namesake city. Thus, with seven original, bronze Lincolns, the first Lincoln namesake city would be second only to Springfield. Most importantly, the eleven total statues of Lincoln in Lincoln would depict him in more capacities than statues in any other city of the world except Springfield, Illinois--athlete, storyteller, student, circuit-riding lawyer-politician, community founding lawyer, 1858 Republican Senate candidate, man of God, citizen reading while striding down the street, and bearded traveler reading a law book while perched on The World's Largest Covered Wagon. These renderings range from the realistic to the mythical and comical. Unlike the proposed Lincoln statue "as tall as the Statue of Liberty" discussed a few years ago in Lincoln, Illinois, the statues proposed here do not involve prohibitive costs. The Lincoln statue as tall as the Statue of Liberty was estimated to cost forty million dollars, so that amount would have had to come from outside corporate sources, but none was found. Rather, the statues proposed here could be developed as affordable projects, accomplished one at a time, with local fund raising and distant solicitation through Web sites, direct email, and social media. These Internet resources make it possible and economical to seek donations from the many former residents who are proud to call Lincoln their hometown. The Internet facilitates collaboration, expanding and strengthening a sense of community. This Lincoln community has a proven track record of statue development. After the Logan County Civil War Soldier Statue Committee completed its work in 2011, some of its members decided to form a new committee for the purpose of erecting a statue of Abraham Lincoln as a politician running for the U.S. Senate in 1858. On October 16, 1858, Lincoln delivered a two-hour campaign stump speech on the west side of the Logan County Courthouse in downtown Lincoln. This speech was the highlight of the "monster" Republican rally--the day after the last Lincoln-Douglas debate (in Alton). According to some authorities, Lincoln's Alton performance was one of his best throughout the campaign. Lincoln's stump speech in his namesake city the day after the Alton debate most likely was a rousing call to action, demonstrating his remarkable oratorical power. This 1858 rally-speech was one of Abraham Lincoln's most significant experiences in his many years of appearing in Logan County, from 1839 to 1860, as a well-respected lawyer, celebrated storyteller, and venerable politician who helped to found the Republican Party in Illinois and develop that party at the national level. 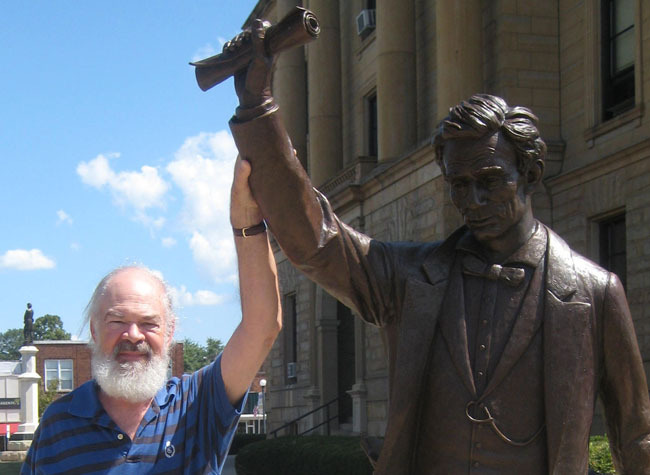 In 2007-- 2008 I proposed a Lincoln statue and historical marker to commemorate the 1858 rally-speech as part of my contribution to the Abraham Lincoln Bicentennial Commission of Lincoln, Illinois. I also proposed a re-enactment of this event, researched it, and wrote the play script for the re-enactment that was performed on October 16, 2008, as the main event of the city's Lincoln Bicentennial Celebration. A link to photos of that re-enactment appears below in References and Related Sources. Proposed statues of Lincoln at Lincoln: 1. Lincoln the Circuit-Riding Lawyer-Politician, erected at the Postville Courthouse State Historic Site; 2. Lincoln the Storyteller, erected across the street from the Postville Courthouse near the two historical markers for the Deskins Tavern and Postville community well; 3. Lincoln the Athlete, erected at the Postville Park near the existing historical marker that refers to his playing "townball" at this location; 4. Lincoln the Man of God, erected in the Abraham Lincoln Memorial Prayer Garden at Lincoln Christian University. This statue was proposed in the 1970s, but then the plan was forgotten. The first three statues listed above would be within two blocks of one another on historic business Route 66 and would call to the countless tourists who travel it. These statues would be only a few blocks from the giant fiberglass Abe statue on The World’s Largest Covered Wagon, also on historic Route 66. These proposed statues would thus strengthen the connection between the two most-celebrated aspects of this community's history-heritage: Abraham Lincoln and the Mother Road. The first and fourth of these proposed statues in Lincoln could be designed using artwork created by the late Lloyd Ostendorf, a respected Lincoln historian-collector and talented artist. Several recent historical markers throughout Lincoln and Logan County feature Ostendorf colorized artwork. These markers are part of the county-wide Looking for Lincoln program under the leadership of professional historian Paul Beaver and Wanda Lee Rohlfs, former executive director of Main Street Lincoln. 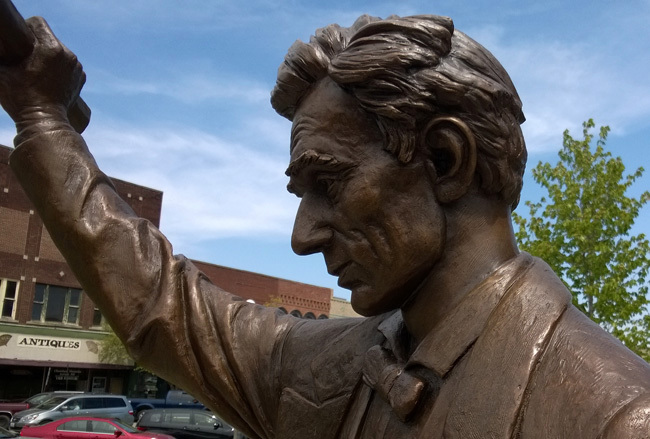 The ongoing process of developing Lincoln statues in Lincoln could inspire other Logan County communities with historic ties to Abraham Lincoln to undertake Lincoln statue projects. Those communities are Atlanta, Elkhart, Middletown, and Mt. Pulaski. Note: I am grateful to the late, lamented Mike Fak for publishing the above proposal at TheLoganCountyHerald.com: http://www.logancountyherald.com/viewarticle.aspx?smid=454&aid=16707, and to Jan Youngquist for publishing it at LincolnDailyNews.com: http://archives.lincolndailynews.com/2013/Jan/11/News/today011113_dlh.shtml. Abraham Lincoln's legal work and political activity at the Postville Courthouse, his storytelling there and at the Deskins Tavern across the street from the courthouse, and his participation in games at Postville Park are described in reliable sources. The above photo is black and white because the faded text on the marker is very hard to read in a color photo. At Postville Lincoln represented not only private citizens, but also Logan County itself. When he returned from his one term in Congress in 1849, he represented the county when it sought to retain ownership of the former courthouse property after the county seat had been moved to Mt. Pulaski and the original owners of the Postville Courthouse property sued to get it back. Also at Postville it is often overlooked that Lincoln participated in politics. Biographer Michael Burlingame writes, for example, that at Postville Lincoln as the 1846 Whig congressional candidate rejected the accusation of his Democratic opponent, the Reverend Peter Cartwright, that he was a religious skeptic. There are very few statues of Lincoln on horseback--Lincoln equestrian statues--, and none like Ostendorf's two striking images seen here. The image above, with the Postville Courthouse in the background, is undated, and it appeared on a laminated placemat in the Rustic Inn restaurant owned by Lincoln buffs Mr. and Mrs. Les Sheridan. I am grateful to my stepmother, Judy Henson, for finding and giving me this placement and others depicting Lincoln. I thank Professor Ron Keller of Lincoln College for giving me a series of black-and-white drawings by Ostendorf that included the one above. 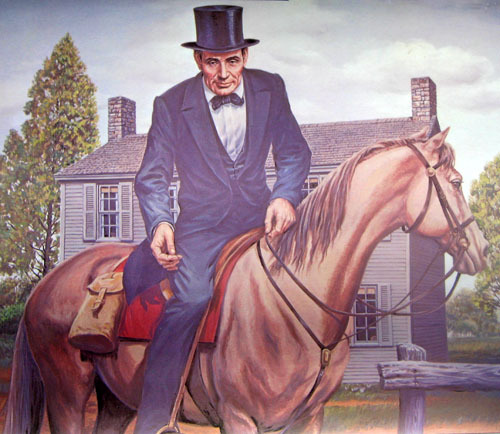 It was commissioned by the Sheridans and the Logan County Abraham Lincoln Heritage, and it was signed by Ostendorf, who dated it 1970 and titled it "Lincoln the Circuit Rider in Logan County." 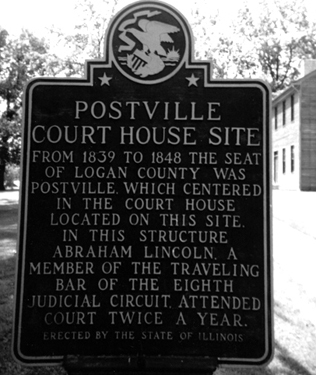 For more information about Lincoln's activities at Postville, see the Web page titled "Abraham Lincoln and the Postville Courthouse, including a William Maxwell Connection to the Postville Courthouse" (link below under References and Related Sources). Lincoln often stayed at the Deskins Tavern across the street from the Postville Courthouse. The well in front of the Deskins Tavern must have been a place where people gathered several at a time, and whenever Lincoln was among them, he had the opportunity to tell the stories and jokes for which he became legendary. 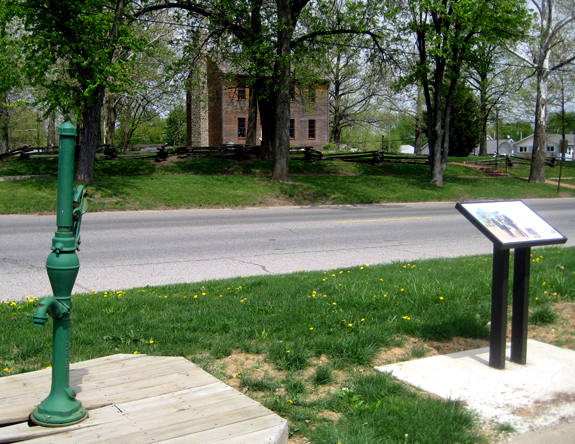 Today the site features two historical markers and a restored well pump fixture (but not connected to a water source). Biographer David Herbert Donald describes the typical social life on the Eighth Judicial Circuit: In "off hours" court participants and observers sought entertainment. "Mostly the attorneys had to amuse themselves, and according to Herndon [Abraham Lincoln's law partner], they engaged in 'fights--foot and horse races--knockdown--wrestling--gambling etc.' Whiskey, he noted, 'was abundant and freely used.' After the evening meal, a local 'circus or lecture' might provide entertainment, but time for fireplace conversation was abundant. "When that happened, Lincoln, of course, was a center of attention, and as Herndon remembered, 'Judges--Jurors--Witnesses--Lawyers-merchants, etc etc have laughed at these jokes. . . till every muscle--nerve and cell of the body in the morning was sore at the whooping and hurrahing exercise.'" 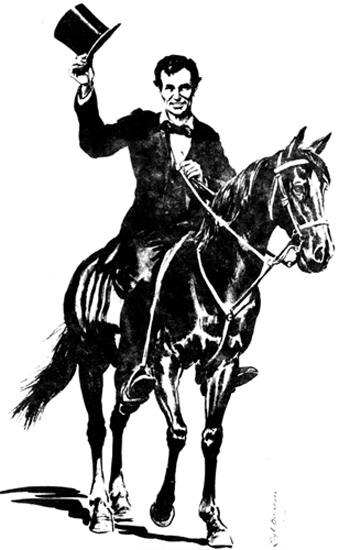 Lincoln liked to retell stories he heard from others, but historian Lawrence B. Stringer describes the following incident that suggests some of the stories Lincoln told originated from his Postville experience: "At one time Lincoln came to Postville from Springfield, in company with Judge Treat, the two riding in Judge Treat's buggy. The occasion was a special term for the trial of a criminal. Treat and Lincoln stopped at the Deskins Tavern. After they had gone to bed and everybody about the hostelry was asleep, there came a terrific pounding at the door. The landlord got up to let in the energetic assailer of the portal, who seemed to be assiduously in search of a drink of whisky and was in the parched condition of the traveler in the Sahara desert, to whom delay is intolerable. The landlord explained that he had no whisky in the house, whereupon his visitor wanted to know if he couldn't get it at some tavern or store. Wasn't there any place in the village where a drink of whisky could be had? To all these questions the landlord returned a negative and as the full horrors of his whiskyless situation burst upon him, the fellow said with emotion, 'Great Heavens! Give me an ear of corn and a tin cup and I'll make it myself.'" Lincoln and Judge Treat listened to this colloquy with great amusement, and the next morning Lincoln asked the landlord what had become of his guest. 'Oh,' he replied, 'the fellow left before daylight.' In after years, Lincoln frequently told this story to amused auditors and he always laid the scene of the anecdote at Postville." A statue could be designed to show Lincoln telling a story to a listener at the Postville well in front of the Deskins Tavern. The listener could be sitting on a bench looking up at Lincoln, who would be gesturing with one hand and holding a drinking cup in the other (thanks to wife Pat Hartman for the idea of the listener sitting on a bench). 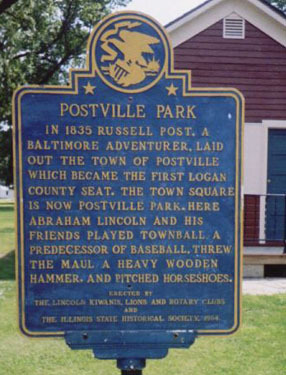 Lincoln the Athlete would be erected near the 1964 historical marker in Postville Park jointly sponsored by the Illinois State Historical Society and the local Kiwanis, Lions, and Rotary service clubs. Those organizations may also be interested in helping to raise money for the statue project. The marker cites Lincoln playing an early form of baseball. Lawrence B. Stringer's authoritative History of Logan County, Illinois 1911 documents this activity: "Lincoln was always a leader in athletics and played ball and various games with the boys. Scores of old residents can remember seeing him out in the Postville Park, after court adjourned, indulging in a game of 'townball.'" Thus a statue of Lincoln as a townball batter would be appropriate to depict him as an athlete. According to the online Baseball Almanac, "Town Ball is a direct descendant of the British game of rounders. It was played in the United States as far back as the early 1800's and is considered a stepping stone towards modern baseball. 1. The Ball must weigh not less than two, nor more than two and three-quarters ounces, avoirdupois. It must measure not less than six and a half, nor more than eight and a half inches in circumference, and must be covered with leather. 2. The Bat must be round, and must not exceed two and a half inches in diameter in the thickest part. It must be made of wood, and may be of any length to suit the Striker." An image at the Baseball Almanac depicts a townball batter much like a baseball batter (http://www.baseball-almanac.com/ruletown.shtml). 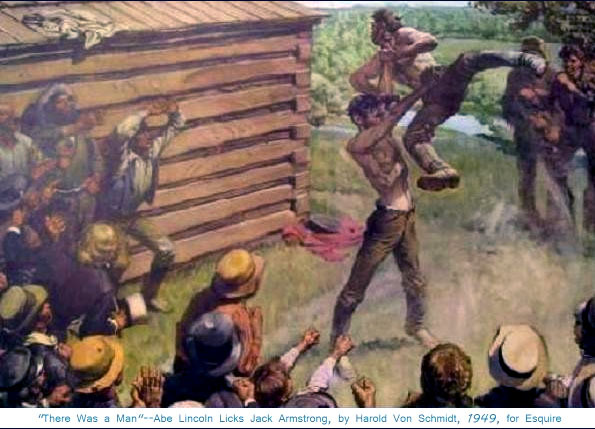 Thus, it is not too difficult to imagine a statue of Lincoln as a young man poised with a stick-like bat ready to knock one out of Postville Park. Another option for Lincoln the Athlete would depict him in his even more legendary youthful distinction as a champion wrestler, as seen in the 1949 drawing below by Harold Von Schmidt. To the best of my knowledge no statue of Lincoln as a wrestler exists. 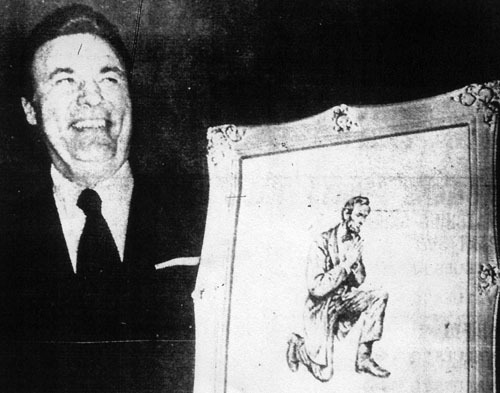 This photo showing Ostendorf with his drawing titled Lincoln in Prayer appeared in the Lincoln Courier, February 13, 1973. Ostendorf dated this drawing December 25, 1972, and on the back wrote this inscription: "Lincoln was known to go to his knees for help from the almighty when he did not know where else to turn; especially for guidance and help before important battles and decisions." The image above is from the Philip H. Wagner collection and was purchased for the book The Town Abraham Lincoln Warned. 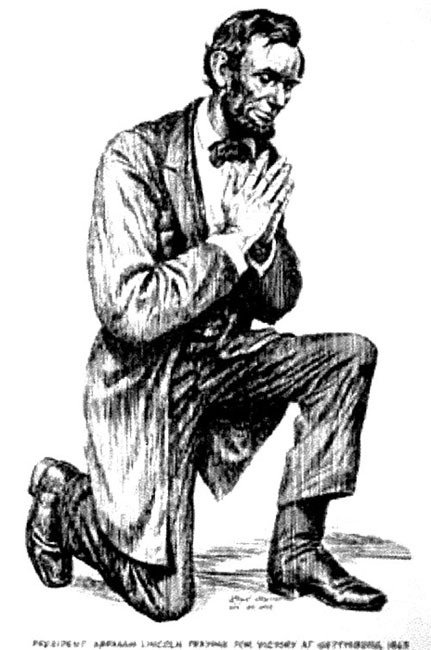 The bottom caption of the drawing reads "President Abraham Lincoln Praying for Victory at Gettysburg, 1863." A stunning giclee (digitally produced inkjet color print) of a praying Lincoln titled To Save a Nation by Larry Winborg is available at http://www.winborg.com. 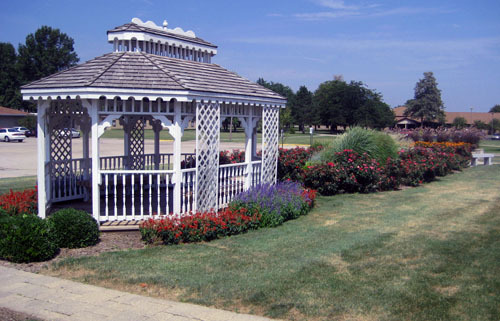 The photo above shows the Abraham Lincoln National Prayer Garden at Lincoln Christian University, just west of the Earl C. Hargrove Chapel. This Garden was dedicated on Lincoln's birthday, February 12, 1973. Lincoln College co-sponsored this event. Dignitaries attending included the late Lincolnite Congressman and Secretary of Agriculture Edward R. Madigan, Lincoln biographer and historian Dr. Wayne C. Temple, Lloyd Ostendorf, and Dr. Elton Trueblood. The late John Morris Webb, professor and dean of the-then Lincoln Christian College, was one of the planners of this event. At the time of dedication, there was a plan to erect a statue based on Lincoln in Prayer. The plan was somehow forgotten. Lincoln Christian University is a private institution, so any revival of the forgotten plan would require some "town and gown" cooperation. The research I did in 2007-2008 to write the proposal and the play script for the re-enactment of Abraham Lincoln’s October 16, 1858, first namesake city “monster” rally and stump speech led to my 2008 proposal for the Lincoln statue project commemorating that event. The re-enactment took place on October 16, 2008, and thanks to the good work of a local committee, a bronze statue of Lincoln as the U.S. Senate Republican candidate was dedicated on May 16, 2015. It commemorates Mr. Lincoln's two-hour campaign "stump" speech in front of the Logan County Courthouse the day after the last Lincoln-Douglas debate (October 16, 1858). According to LincolnCourier.com (May 14, 2012), the statue depicts Lincoln "on his soapbox, speech in one hand, stovepipe hat in the other." Mr. Lincoln's 1858 namesake city Republican rally and speech provided his most significant political experience in Lincoln and Logan County. Lincoln always learned from experience, and scholars note that he got better and better during the debates. He became more effective in refuting his opponent's ill-founded accusations, and he increasingly emphasized the moral argument against slavery and its extension into territories. Lincoln would thus have been at the height of his oratorical powers to date when he spoke in Lincoln the day after the last debate. Although undoubtedly tired, he was well known for his stamina and penetrating voice. The statue was installed on the lawn of the Logan County Courthouse, providing both a majestic source of civic pride and one of the most powerful tourist attractions in the downtown historic district. All who see it will have an opportunity to learn more about Lincoln the principled speaker and Lincoln the city. The statue committee's choice of sculptor is David Seagraves, who fabricated the replacement for the fallen Civil War Union soldier statue and who repaired the marble Indian Mother statue, both also on the Logan County Courthouse lawn. The estimated cost of the Lincoln statue is $48,000. Local historian Paul E. Gleason and Roger Matson are co-chairmen of this project, and JoAnne Marlin is the secretary. Other accomplished, dedicated civic leaders on this statue committee are Professor Emeritus of history at Lincoln College Paul J. Beaver, Chuck Conzo, historian Bill Donath, Mary Ellen Martin, Joseph Mintjal, Wanda Lee Rohlfs, and John Sutton. Several on this committee gained experience in this kind of project when they served on the committee to replace the fallen Civil War Union soldier statue (see links below under References and Related Sources). The source of the cropped image above is Phil Bertoni's extensive Web site for Mt. Pulaski, Illinois. Access the following link for an image of the entire painting: http://www.mtpulaskiil.com/mtpulaskiilWEBsite/Courthouse/1858_AbeLincolnSpeech/speech.jpg. A proposed location for this new Lincoln statue is on the southwest corner of the courthouse block as depicted in a study for improving the public face of the business district of Lincoln, Illinois. Access a drawing of the proposed new layout of the courthouse block showing the statue's possible location. The Lincoln Statue Committee is affiliated with the Logan County Genealogical & Historical Society, 114 N. Chicago Street, Lincoln, IL 62656. 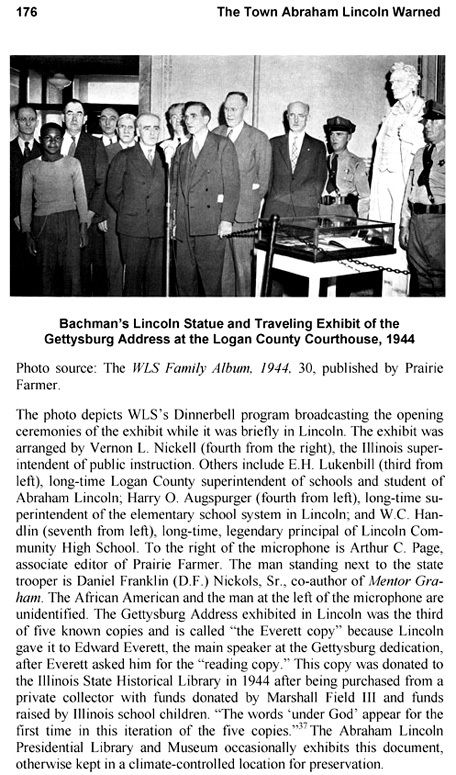 After my original research in 2007--2008 on Mr. Lincoln's 1858 stump speech in his first namesake town, I did further research on Lincoln statues, including Max Bachman’s Lincoln statue in the rotunda of the Logan County Courthouse. In my article titled “Max Bachman’s Lincolns” (link below under References and Related Sources), I explain that his Lincoln statue is actually a hybrid: the body is modeled from Saint-Gaudens' famous 1887 Standing Lincoln in Chicago’s Lincoln Park, while the head and shoulders were Bachman's original work. In planning the model for the sculpture of Abraham Lincoln to commemorate his 1858 namesake town stump speech, the local Lincoln Statue Committee instructed the sculptor they hired for the project, David Seagraves, to use the image of Lincoln in the above painting titled Lincoln in Lincoln by Jennifer Boeke. Her portrayal, as seen in the above image, credibly shows Lincoln holding a rolled-up copy of his speech in his right hand, arm extended above his head, with his left hand holding his trademark hat, left arm somewhat extended at his side. Yet the problem with the Statue Committee's assignment is that the depiction of Lincoln in the painting is much too small to reveal details of his head, especially the face. As a Lincoln buff, I am interested in artistic depictions of him, especially in sculpture, and I favor realist portrayals. I have found only two photos of Abraham Lincoln taken during the 1858 US Senate campaign, including Lincoln-Douglas debates: one by Calvin Jackson on October 1, 1858, just before the fifth debate (Galesburg) and one by William J. Thompson on October 11, 1858, just two days before the sixth debate (Quincy). The Quincy photo, then, was taken just five days before Lincoln’s rally and two-hour speech in Lincoln, Illinois. My opinion of Mr. Seagraves’s model announced in January 2013 was that it did not very accurately depict Lincoln’s hair and face. Mr. Seagraves's Lincoln head model is shown at the lower left of the graphic below. I created this composite graphic to compare the two known photos of Lincoln during the 1858 Senate race with the head and shoulders of the clay model of the Lincoln statue by David Seagraves and the head and shoulders of the Bachman Lincoln statue in the rotunda of the Logan County Courthouse. You will notice several striking similarities between the October 1, 1858, photo by Calvin Jackson (taken in Pittsfield, Illinois) and Bachman's Lincoln. The black-and-white photos immediately below are from The Lincoln-Douglas Debates: The First Complete, Unexpurgated Text, ed. Harold Holzer (Fordham University Press, 2004). The lower-left, color photo, showing the head and shoulders of David Seagraves's clay model of the current Lincoln statue project, is from LincolnDailyNews.com, 2-27-13. The lower-right photo of Max Bachman's Lincoln in the rotunda of the Logan County Courthouse was taken in 2003 by Leigh Henson. Bachman's research-based Lincoln above at right well captures the principled tenacity that led to his presidency and his justified legend as our nation's greatest president. 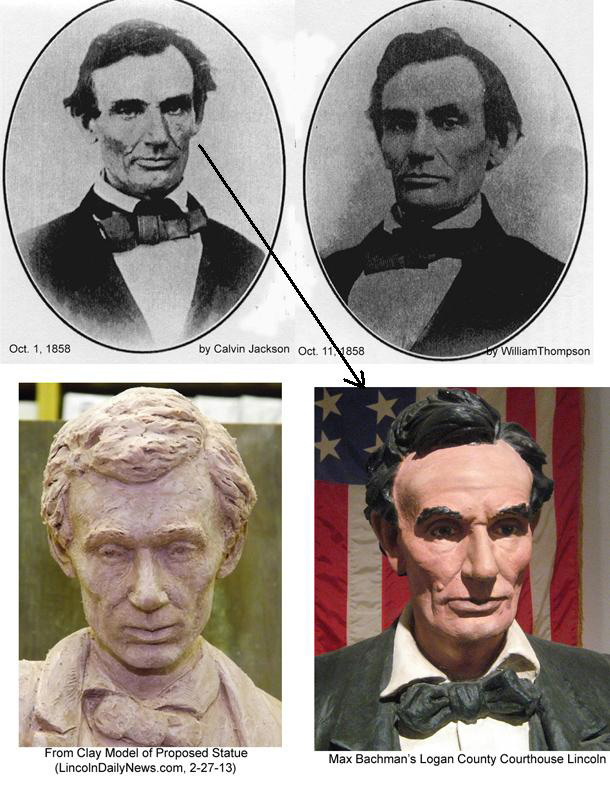 As indicated by the above images, the Jackson photo is apparently a source Bachman used in creating his Lincoln head. Such other sculptors who depict Lincoln as John McClarey have also used photos of Lincoln to help them craft the details of their art. On February 27, 2013, I emailed various people, including members of the Lincoln Statue Committee, to tell them of my discovery of the close resemblance between the Jackson photo of Lincoln and Bachman’s Lincoln sculpture in the rotunda of the Logan County Courthouse. My email included a link to the preceding graphic comparing Mr. Seagraves's model to the head of Bachman's statue and the photo it was based on. Included in the group receiving this email was Carl Volkmann of Springfield, Illinois. Mr. Volkmann was a leading authority on Lincoln statues and the author of a book titled Lincoln in Sculpture. I separately emailed Mr. Seagraves to provide him with the same information. My message was intended to make an indirect, tactful suggestion that Mr. Seagraves’s model needed revision to make it more realistic. During the rest of 2013 and all through 2014, I read occasional online reports about fundraising progress for the statue, including the sale of the 30 bronze miniatures at $2,000 apiece. I wondered how the design and production of the statue were going, but did not see any news relating to those matters. See links to reports about fundraising near the bottom of this webpage. Thanks for your interest. I began with a sketch model, which was the one you commented on back in 2013. That model established the pose, with refinements coming later, once the committee approved the basic concept. I then improved the model to the point that it was suitable for casting (Casting the edition wasn't part of the original plan). I agreed that Bachmann's Lincoln was superb, and luckily owned a plaster copy of that Bachmann bust, which I put to good use. I also used many Lincoln photos. Once I began the full-size clay statue, I constantly revised and hopefully improved the original image. I kept the committee up to date with progress photos, and they were happy with the refinements/revisions that I made, with few suggestions after the initial conceptual stage (the model). Again, thank you for your comments of 2013. We were in agreement; much work had yet to be done. The photos I saw of the installation of Lincoln Rallies the People did not very well show details of the statue’s head and shoulders, so I emailed my friend and fellow history buff, David Doolin, in Lincoln to request close-up photos, and he graciously sent the following, with permission for them to appear on this webpage. He holds exclusive rights to these images. David Doolin is the developer and publisher of a fine website titled ExploreLoganCounty.com with abundant information about and stunning photos of sites in Logan County, Illinois, that its citizens and tourists will find interesting. Link to http://www.explorelogancounty.com/AttractionsAndTourism.aspx. Link to Mr. Seagraves's professional website: http://www.davidseagraves.com/. The Lincoln Statue Committee is affiliated with the Logan County Genealogical & Historical Society, 114 N. Chicago Street, Lincoln, IL, 62656; link to its website: http://www.rootsweb.ancestry.com/~illcghs/. Members of the Lincoln Statue Committee include Chuck Conzo, William "Bill" Donath, Paul E. Gleason, JoAnne Marlin, Mary Ellen Martin, Roger Matson, Joseph Mintjal, Wanda Lee Rohlfs, and John Sutton. 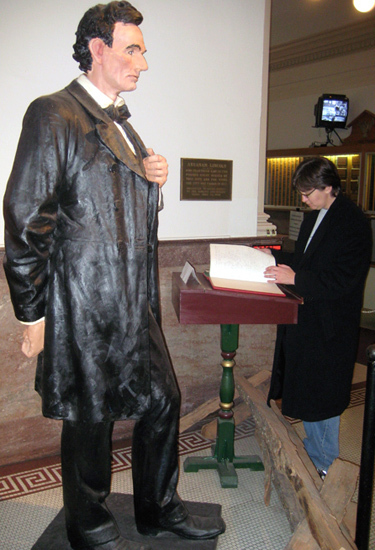 This slightly larger-than-life rendition of President Lincoln was donated to the Logan County Genealogical & Historical Society by Sandra Sue and Earl Dale Williams of Lincoln and is displayed in the Society's Lincoln Room in downtown Lincoln on Chicago Street. This work was originally displayed at the Lincoln Carriage Museum at Petersburg, Illinois, near New Salem, and was purchased somewhere in the East. The Williamses estimate the date of creation from between 1890 and 1910. The name of the sculptor is unknown, but this piece strongly suggests the work of Max Bachmann. More information about all the statues below can be found in my book The Town Abraham Lincoln Warned: The Living Namesake Heritage of Lincoln, Illinois (link below under References and Related Sources). The photos below are by Leigh Henson and his wife, Pat Hartman. 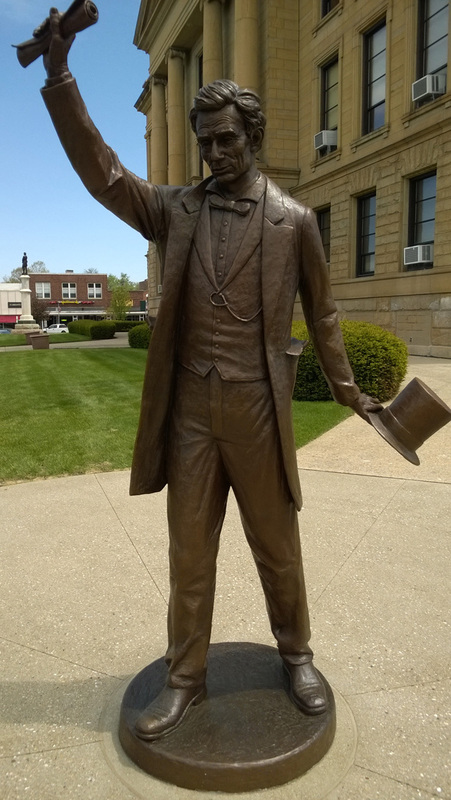 In February 2019, the State Bank of Lincoln generously offered this statue on "long-term loan" to the Logan County Tourism Bureau. The statue is on public display in the bureau's headquarters at the intersection of Broadway and Chicago Streets, near the site where Abraham Lincoln, the town's founding attorney, christened the town in his name with watermelon juice on August 27, 1853. The first town lots were publicly sold on that date. The statue had stood in this bank's lobby for many years. Scroll down for more details. I took this photo during the city's 2003 Sesquicentennial Celebration. 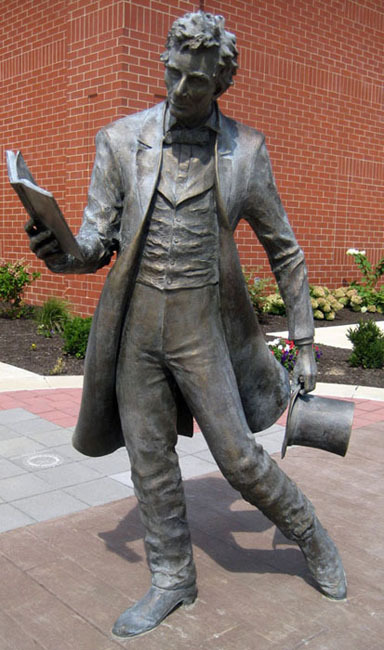 The Lincoln Savings and Loan Association of Lincoln, Illinois, commissioned this statue in the early 1970s, and it was fabricated with an unidentified alloy. The State Bank of Lincoln acquired this work, which for many years was exhibited at the bank's main facility (corner of Broadway and Sangamon Streets). In the bank's exhibit, around the feet of this statue, on a raised wooden platform and created from the same material as the statue, were quaint representations of the halves of a watermelon, watermelon seeds, and Lincoln's palms. On the floor to the right of the platform were metallic representations of the soles of Lincoln's size fourteen boots. This bank also exhibited numerous Lincoln busts as well as life masks. The above seven-foot+ statue was dedicated in 1939. Kendra Henson, the author's daughter, reads the guestbook. 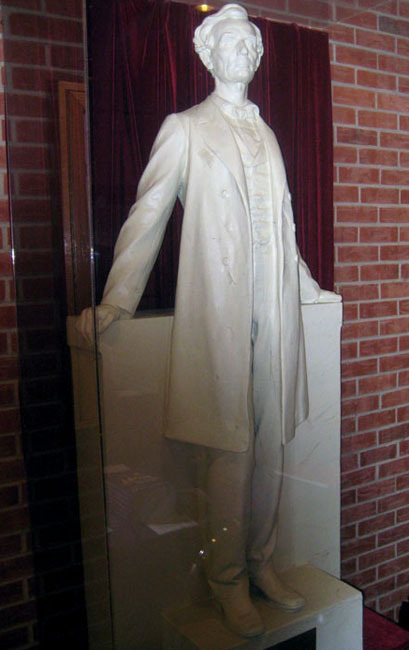 Bachman's Standing Lincoln statues were a hybrid design: he created the head, while the body was a replica of Augustus St.-Gaudens' famous Standing Lincoln. Unveiled in Chicago's Lincoln Park in 1887, that statue is world renowned for its realism. According to historian Carl Volkmann, Saint-Gaudens [1848–1907] "was the first sculptor to use the life mask of Lincoln and the casts of his hands made by Leonard Volk before Lincoln became president." Incidentally, Volk first met Abraham Lincoln in July 1858 in front of the Lincoln House hotel at Lincoln, Illinois, as Mr. Lincoln was traveling to monitor Douglas's Senate campaign speeches. William H. Herndon, Lincoln's long-time law partner, provided a detailed description of Lincoln's oratorical posture and gestures, praising Saint-Gaudens' Standing Lincoln for its accuracy in depicting Lincoln the political speaker: "the designer of the monument recently erected in Chicago has happily caught him [Lincoln] in just this [speaking] attitude." For my article titled "Bachman's Lincolns," including photos of his various Lincoln statues and busts, see the PDF link below under References and Related Sources. The following page 176 from The Town Abraham Lincoln Warned: The Living Namesake Heritage of Lincoln, Illinois, presents the city's most historic event related to Bachman's Lincoln statue. The photo shows the statue's original, ghost-like, white-plaster appearance. The exact date the statue was painted is unknown, but was probably in the 1970s according to historian Paul Beaver. 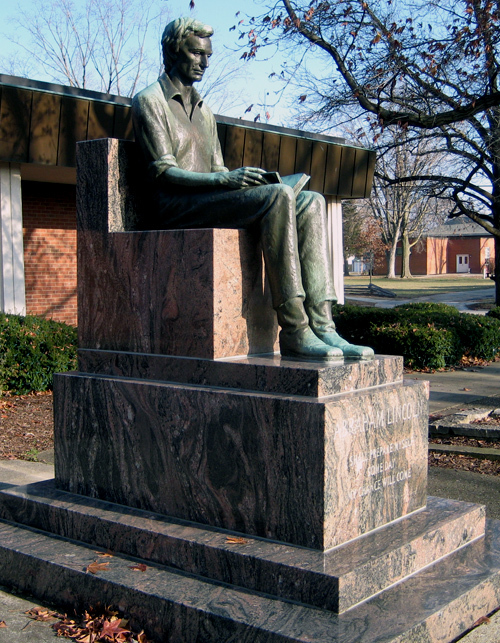 Lorado Taft's Lincoln the Lawyer was dedicated in 1927 at Carle Park, Urbana, Illinois. This replica is housed at Lincoln College in the Meyer-Evans Student Center, and I am grateful to Professor Ron Keller for calling my attention to it. Dr. Thomas Schwartz, the former Illinois State Historian, told me this replica was acquired by the late historian James T. Hickey, who was a mentor of Dr. Schwartz at the former Illinois State Historical Library, now the Abraham Lincoln Presidential Library. I took Mr. Hickey's course in Abraham Lincoln at Lincoln College in 1960-61. Photo taken in 2010. 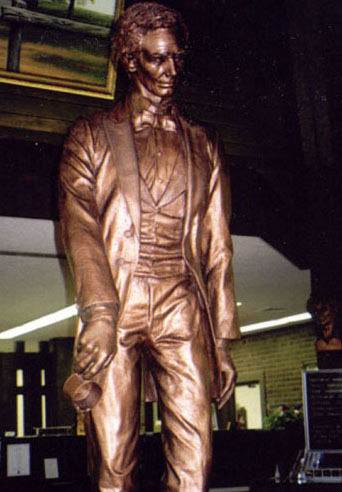 Gage's bronze Lincoln the Student was dedicated in 1961 at Lincoln College near the northwest corner of Keokuk and Ottawa Streets. The inscription on the base is attributed to Lincoln: "I Shall Prepare Myself--Someday My Chance Will Come." Photo taken in 2010. For more information about Lincoln the Student, including photos of the 1961 dedication, dedicatory remarks by Raymond N. Dooley (legendary president of Lincoln College), and biographical information about him and his talented wife (partner in the administration of Lincoln College), access http://findinglincolnillinois.com/historians.html#gagestatue. In 1956 Gage's documentary film about creating Lincoln the Student won an academy award. A link to more information appears below under References and Related Sources. Jumonville's unnamed bronze Lincoln was dedicated at Lincoln College in April 2010. This photo on the front cover of my Lincoln heritage book depicts Lincoln on The World's Largest Covered Wagon, as recognized in The Guinness Book of World Records. This work of folk art is sometimes referred to as The Railsplitter Covered Wagon. David Bentley, a former Illinois State Police officer from Pawnee, Illinois, required six months to complete this work in 2001 as he recovered from illness. In 2007 this work was disassembled and moved to Lincoln after native Lincolnite Larry J. Van Bibber donated $10,000 for its purchase. Photo taken in 2010. Email D. Leigh Henson at DLHenson@missouristate.edu. Also, he invites connections at LinkedIn http://la.linkedin.com/pub/d-leigh-henson/16/1a5/923 and/or Facebook https://www.facebook.com/leigh.henson. "New Abraham Lincoln statue fundraising launches," Feb. 7, 2013, http://archives.lincolndailynews.com/2013/Feb/07/News/today020713_st.shtml. "'Friends of Lincoln'" sponsorships would be noted as the Hickox level for donations up to $100, as Judge Davis up to $500, as Oglesby up to $1,000, as Parks up to $2,500, as Latham up to $5,000 and as Gillett up to $10,000. 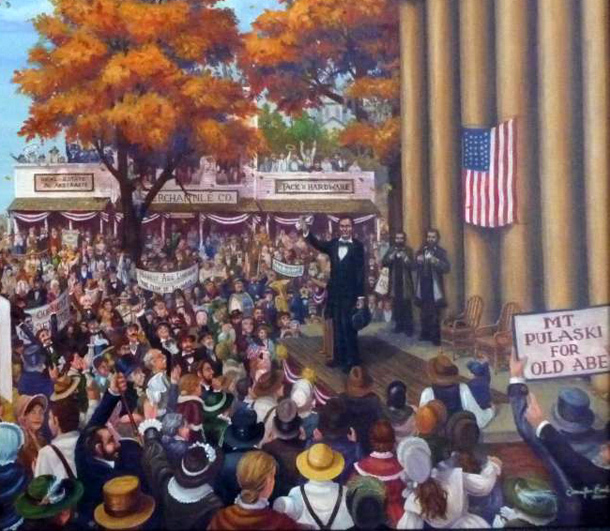 Main Street Lincoln is assisting the effort by supplying limited-edition prints of a painting it had commissioned of the Oct. 16, 1858, Lincoln rally at the Logan County Courthouse steps. Individuals may donate $100 for a print. It is available to corporations for $500 framed." "Scale model of new Abraham Lincoln statue presented," Feb. 27, 2013, http://archives.lincolndailynews.com/2013/Feb/27/News/today022713_st.shtm. Abraham Lincoln Bicentennial Commission of Lincoln, Illinois, http://findinglincolnillinois.com/abes200th-lincolnil.html. I was an honorary and contributing member of this Commission. One of its goals was to find ways to expand the local Lincoln heritage and advance it into the future, and this statue plan has been created in that spirit. "Abraham Lincoln Images," Abraham Lincoln Online, http://showcase.netins.net/web/creative/lincoln/resource/sculpt.htm. Also: http://showcase.netins.net/web/creative/lincoln/art/sculpt.htm. 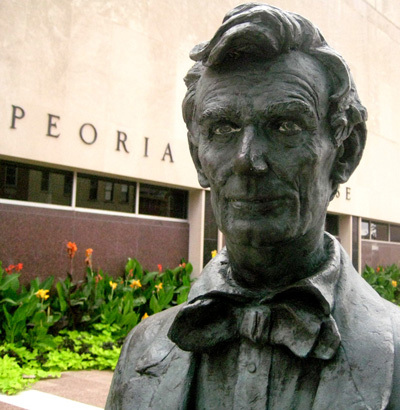 These Web pages have abundant links to information about various Lincoln statues in Springfield, Illinois, and other locations in Illinois and elsewhere. 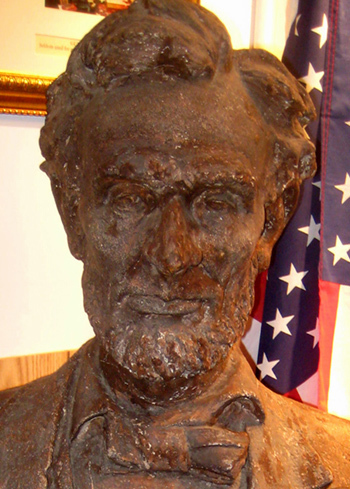 Abraham Lincoln Tourism Bureau of Logan County, Illinois, http://www.abe66.com/. Gage, Robert Merrell, "The Face of Lincoln" at Wikipedia, http://en.wikipedia.org/wiki/The_Face_of_Lincoln. An Internet search using this title identifies online sources presenting this film, including http://www.youtube.com/watch?v=hiIKXamyJ7w. Henson, D. Leigh, 2008 proposal submitted to the Abraham Lincoln Bicentennial Commission of Lincoln, Illinois: "An Abe Rally-Speech Statue: A Centerpiece of Civic Pride and a Tourist Magnet," http://findinglincolnillinois.com/bicentennial/AbeNamesakeCityStatueProposal.pdf. Links to news media publications of the 2008 statue proposal: http://archives.lincolndailynews.com/2008/Oct/30/LDN/letters103008_a.shtml and http://www.lincolncourier.com/article/20081103/News/311039891. Henson, D. Leigh. "Abraham Lincoln and the Postville Courthouse, including a William Maxwell Connection to the Postville Courthouse," http://findinglincolnillinois.com/alincolnandpostville.html. Henson, D. Leigh, "Max Bachman's Lincolns," including photos of his various Lincoln statues and busts, http://findinglincolnillinois.com/abestatueplan/bachmanslincolns12-12.pdf. 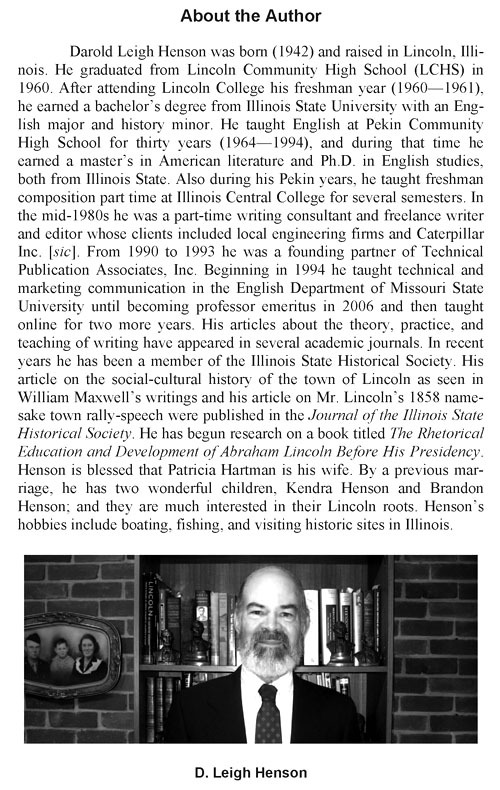 This article was accepted for publication in Illinois Heritage, the full-color magazine of the Illinois State Historical Society. 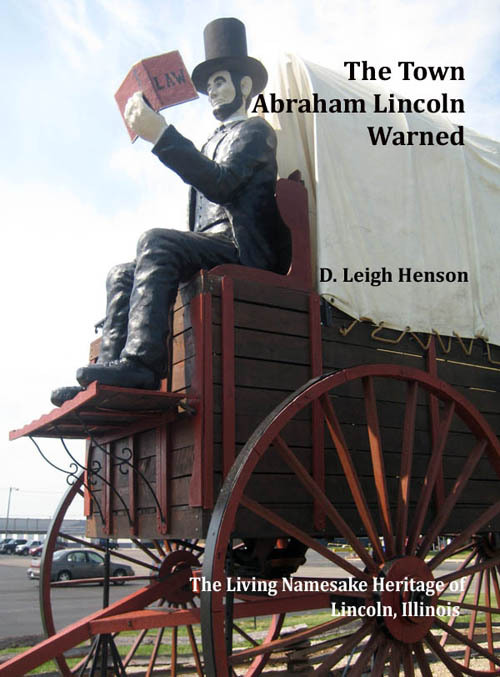 Henson, D. Leigh, "Chapter 7, Almost Nothing Is Carved in Stone: Lincoln Statues, Busts, and Life Masks" (in Lincoln, Illinois), The Town Abraham Lincoln Warned, http://findinglincolnillinois.com/townabewarned.html. Jackson, Jacqueline, "Lincoln in Bronze," a review of Volkmann's Lincoln in Sculpture, with a focus on Gage's Lincoln the Student, http://www.illinoistimes.com/Springfield/article-6243-lincoln-in-bronze.html. "Lloyd Ostendorf--Author and Artist," http://www.abelincoln.com/partners.html. This site has Ostendorf artwork for sale. Looking for Lincoln Heritage Coalition Web Page for Lincoln, Illinois, http://www.lookingforlincoln.com/communitydetails/lincoln. Mannlein, Arlene, review of Carl Volkmann's Lincoln in Sculpture, http://herald-review.com/lifestyles/article_78e1a285-7197-5b60-8e24-3a77eedf697e.html. Nevel, Jason, "'Prairie Lawyer' Sculpture Dedicated at Lincoln Home," http://www.sj-r.com/top-stories/x1038184463/Prairie-Lawyer-sculpture-dedicated-at-Lincoln-Home. "Oversized Lincoln Statue Will Cost $40 Million," http://www.roadsideamerica.com/news/8490. Schieffer, Theresa, "Civil War Statue Has Landed Here," http://www.lincolncourier.com/news/x532922059/Civil-War-statue-has-landed-here. This article tells about the installation of David Seagraves's bronze replacement Union soldier statue on the Logan County Civil War Monument, including a photo of the statue. For photos of this statue before its installation, access http://www.lincolncourier.com/photos/x1700897043/Logan-County-Civil-War-Soldiers-Monument. Volkmann, Carl, "Lincoln Home Speech," the unpublished keynote address at the dedication of Prairie Lawyer at the Lincoln Home National Historic Site in Springfield (2011). I am grateful to Mr. Volkmann for sharing this information, including the statue numbers used in developing this proposal. Link to the obituary of Carl Volkmann: http://www.legacy.com/obituaries/sj-r/obituary.aspx?pid=167571243. Volkmann, Carl and Roberta, Springfield's Sculptures, Monuments, and Plaques (Chicago, IL: Arcadia Publishing, 2008). Volkmann, Carl, Lincoln in Sculpture, http://abesblogcabin.org/lincoln-in-sculpture-by-carl-volkmann. The Volkmanns' books are available in downtown Springfield in the first-floor bookstore of the Illinois State Historical Society, located on the north side of the old State Capitol Square. Von Schmidt, Harold, source of There Was a Man, https://clatterymachinery.wordpress.com/category/wrestling/. Wiegers, Dave, http://dbwiegers.zenfolio.com/. Stunning photos of Lincoln statues. Woodside, Nathan, "Planning for Lincoln Statue Underway," http://www.lincolncourier.com/topstories/x1266610280/Planning-for-Lincoln-statue-underway.